It's been about a year and a half since the Modern theme became available, which brought with it new colors for Fanfare, IRL, and Jobs, which were and are white in Classic. There were a few requests for getting the colors added to Classic, but it never happened. Maybe now is the time? I already touched base with the mods about this, who are sympathetic but basically there needs to some demonstrated demand for this for it to actually happen. So if you're using the Classic theme and you'd like some purple on your fanfare (or brown on jobs or orange on IRL I guess but for me this is mostly about fanfare), here's your chance to speak up. Yeah, this is one of those things where I'm kinda onboard with the idea because I love colors (I use Modern theme in Dark Mode all the way) but also recognize that a lot of folks here are allergic to sudden big visual changes. I think sneaking more color into Classic would be fun, but while "we've got Classic Plain theme if you don't want color" is easy to say, I would want to get some serious buy-in from folks using Classic about such a change before we could really move on it. INFIDELS. CLASSIC MEFI 4 LYFE. Is there an easy way to let users set unified themes? Could we have some kind of kuler-off? The site should have a built-in Stylish function so that every single element can be recolored however you wish. Alternately could we see the Chevy theme make a comeback? I am a classic theme user who would support color for the additional sites. I AM 1000% IN FAVOR OF PURPLE FANFARE even though I read everything in professional white these days. HOWEVER if there is anyone I can send money to, any phone banks I can work, any petitions I can sign to make Fanfare purple, I am with it, on it, and for it! Fanfare should be the color of whatever tie The Whelk is wearing that day. For IRL, how about a beer color? I like ales, but perhaps lager/Guiness could be preferences. I assume Jobs is named for Steve Jobs, so silver and white are appropriate. I'm really not a fan of the Modern theme at all. I tried it for about three days and went straight back to Classic. If these colors are added to the Classic theme, would there be a way to keep the existing Classic theme exactly as it is now, with no changes? Maybe a Classic:Classic and a Classic:Colors? Yeah, this is one of those things where I'm kinda onboard with the idea because I love colors (I use Modern theme in Dark Mode all the way) but also recognize that a lot of folks here are allergic to sudden big visual changes. If only pb could write some code to change the background color so slowly that nobody would notice. I use classic and I promise not to care what color the background is. Purple sounds just plummy to me! I use the classic theme exclusively and have no opinion on changing those subsites. If you do, cool, if you don't then eh. Really helpful huh? Yes, the One True Style. Re: The slowly changing colors, it was originally an April Fool's joke from 2008. Spawned a couple of metatalk posts. And then the prank was duplicated last year on the same day. As a professional who is professional and uses the professional background (you know, the white one. For professionals) I'd love it if the top colors were granted to those subsites. I like the subtle difference. It's... professional, really. Green text, orange background, blink tag enabled. I want to feel like it's 1995 again. MetaFilter Theme request; thank you. Modern light here, but I would not be mad at a theme that makes MeFi look like reading webpages in an old unix text editor. However I would prefer vim because I am not insane and/or a multi-tenticaled outer space alien. I use classic and have no opinion either way on this. Of the three in white, I only read Fanfare, so a change to jobs or IRL wouldn't really affect me at all. I've been avoiding Fanfare because I'd like to get some work done at some point, but more importantly, because it was too hard on the eyes. As someone who smokes Filters' Classic ℳ 99's exclusively, I would absolutely ride this pony into the sunset. Not really getting the foot-dragging on this. People who want the subsites to stay both Classic and blindingly white are presumably already using the ClassicProWhite theme. We change-averse cranks have been asking for colour since those subsites went up, because you changed our dark theme to something we have to squint at. It's been a year and a half already?? Somehow, Metafilter dilates my frame of time reference in relation to other things. Sometime in the near future, it's going to spit me out an old man. In all seriousness, if I can't get a theme with a white or VERY light-pastel background, I'll be disabling all page styles. Trying to read text on colored backgrounds makes my middle-aged eyes tired in a hurry. There are two themes with white backgrounds - Classic-Plain and Modern. Those aren't going away. Am I missing something? Maybe I misunderstood, I thought this was talk of changing the Classic-plain theme. Don't mind me, carry on! If this gets done, could we possibly get the IRL color just little bit less baby-poop-ish? It's definitely the hardest on the eyes of all the Modern pages. Yeah, to be super clear, this is just about adding color to some of the small handful of currently-white subsites on the otherwise-colorful Classic theme, the one from which we got "the blue" and "the green" and so on lo those many years ago. 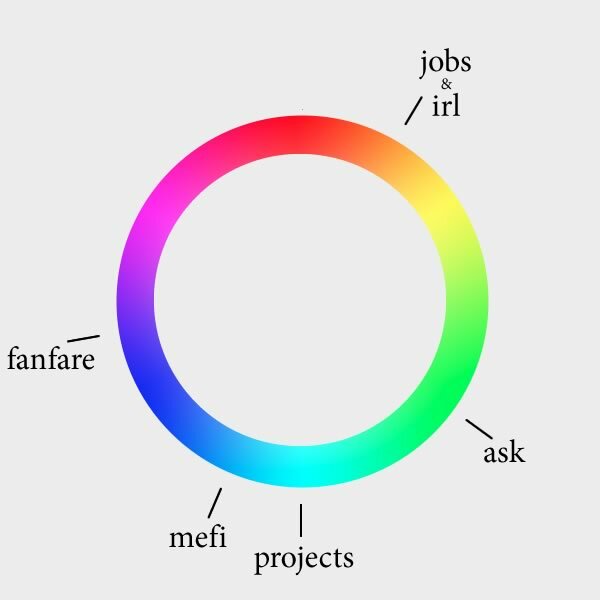 FanFare and IRL, specifically, have colorful background on the colorful Modern Dark, but are a default very-bright white on the otherwise colorful Classic. Modern Light and Classic Plain are both white across the board and would stay that way regardless. If this gets done, could we possibly get the IRL color just little bit less baby-poop-ish? That has been on my todo list for a while regardless, yeah. Have never been a fan of that one, just haven't gotten around to working out a tweaked palette yet. I would like to see the other subsections on colored backgrounds too, plz. Hi five to anyone using classic theme with no post titles. For IRL, could I suggest something in the cerise region? It'd round out the hue distribution, which (sampling the OTS backgrounds) currently looks like this. This is me. I am this person, I would like this thing. Oh, yeah, I'd forgotten I'd installed that script, too. I think this is the one I'm using, through Tampermonkey in Chrome. It seems really weird to me that this wasn't already done, other than just procrastination. The folk who want a white background have an option for that and the classic-non-white-background is supposed to, um, not have the white background. Those subsites should have had the colored backgrounds a long time ago. But I don't have a horse in this race -- I use modern on dark mode. Yes, yes, please make fanfare purple! Although preferably a slightly less intense purple than the modern theme (dark mode) purple. WHAT HOW DOES IT WORK ON CHROME TELL ME RIGHT NOW, how do i make the monkey do the thing? ugh wait the fanfare recolorer is different from the comment divider script, isn't it. And then the prank was duplicated last year on the same day. No, last year's April Fools Joke was a take on the white/gold, black/blue dress phenomenon that was going on at the time. The earlier version was a very slow and entirely subtle color change scheme that would take one by surprise over time. Last year, it changed color quickly and was a much more limited color palate because of the whole dress thing. Maybe I misunderstood, I thought this was talk of changing the Classic-plain theme. I did this too. I use the plain white Professional, I forget everyone doesn’t, and I think of it as Classic when people mention Modern vs Classic. OK, so is someone screwing with me now? Because the main page is pink. Not so bad, but doesn’t work with the teal. > OK, so is someone screwing with me now? Because the main page is pink. Did you click on zarq's "On" link? It enables the old April Fool's color changing. Just click on the "Off" link to stop it. Or, y'know, just go with it for a while. Jump ahead to about 2:00 here and just try to mellow out the best you can, ok? Ha! Thanks. I did click on it and thought it didn’t do anything. Thank you for this! My pony request was going to be, "please bring back the Make it Start button on the profile page." No change is necessary in this matter. The folk who want a white background have an option for that and the classic-non-white-background is supposed to, um, not have the white background. This is a very good point and tips me over to purple-it-up-ness. Classic person. More color is good, flat white background hurts my eyes under most circumstances, and reminds me of MS Word in all others. I use classic theme. I have professional white backgrounds on some devices, but especially on my phone and tablet which I read in dark rooms, I like the colors because they are less bright. And I have growled a bit when clicking on something that took me to FanFare, because the light it burns. I use classic plain and I need the thing I use to stay white and am fine if other stuff gets colored up. I made my titles smaller than the body copy which makes them 1. easy to skim over and ignore, and 2. easy to read quickly when people post their question intro as a continuation of something they said in the title (WHY DO PEOPLE DO THIS). Also properly color the message bar in plain mode pls. One thing I love is when the CSS stylesheet doesn't fully download, and I get to see the site displayed in a wonderfully light Helvetica Neue. Colors aside, I'd love an option to customize the site-wide fonts (not just comments). As a Classic user I hereby give my permission for this to happen. You are welcome. I don't suppose it's possible to have separate settings for desktop and mobile platforms? I prefer classic on my iMac, but modern is far better on my iPad. Somehow, I've managed to have them set the way I like it, but every time I change a setting of some sort, both platforms end up set to the same theme. So, I have to hack my way back to how I like it. It sure would make life easier if there was a way to set them individually. Preferences for what display theme you're seeing are set per-device anyway, so you should already be able to do that. I'm not sure why changing other settings would change the display setting. Can you say more about what happens? I'm not sure why changing other settings would change the display setting. Can you say more about what happens? I have Modern set on my iPad and Classic on my iMac. While on the iPad, let's say I go into my preferences and change something, like my occupation. Then, of course, I click Save. The next time I hit MeFi on my iMac, it will be in Modern, instead of Classic. Sorry about the confusion, Thorzdad. That's the way things work. When you click Save on your preferences, those preferences become the default the next time you open your Preferences page (on any device). It makes it easy to make a single change and then re-save in your other browsers. But it also means you need to reset any device-specific preferences each time (if you changed it elsewhere). It's a little gotcha but understandably annoying. This FAQ entry does a better job of explaining things: How do MetaFilter display preferences work? Specifically the last paragraph describes how things work when you're using multiple devices. I am a Classic theme non-professional user who would very much like this pony! I bet it would increase the likelihood of my reading FanFare. Yes color. Can't stand whitey, reminds me of The Man (facebook). As a Classic Theme user, I'm all for this change. Seems like how it should've been from the beginning, to be honest. Yeah, I just recently went back to the Classic mode on desktop (without titles o/*\o) and it's soooooo nice to be home. I've been asking for the new colors to be introduced to Classic theme since Modern theme came out. Also, and I know this is probably still a non-starter, but any chance of a preference to switch the Modern theme's green highlight color to "Classic Yellow"? The only style change I care about (being a Classic user) is turning Fanfare purple. I would really, really, really, super-appreciate purple Fanfare, especially if it were... the purple equivalent of MeFi blue? Does that make sense? Like, that kind of saturation, I guess? Classic no-title here user here. As long as the green/gray/bue stay the way they are, I don't use the other subsites enough to care what happens to them. YES PLEASE MAKE FANFARE PURPLE. As a classic theme user, I hate being stabbed in the eyes by FanFare's white background. It's the main reason I've ignored FanFare for almost 2 years, casually flipping over there from the Green was painful so I just didn't bother. I hated the white background so much that I installed Rhaomi's page recoloring thingy to stop the stabbiness and finally learned to love FF. So yes, please purple. Purple. Please. Okay! We're gonna go ahead and pursue Operation Saturation, and bring Modern's color schemes over to the currently bright-white pages of IRL, Jobs, and FanFare on Classic (again, Classic Plain will be unaffected). While we're at it, we're also at long last taking a shot at tweaking the IRL color scheme itself to something a skosh darker and redder and slightly less likely to bring out references to the contents of an infant's diaper, so I'm excited about that as well. pb's got to do a certain amount of plumbing to make all that work; we got a good start yesterday but I don't have an ETA for getting it all finished up. But soon. Why not set the message bar colors for FanFare, Jobs, and IRL in Classic Plain too? I use Classic-Plain (professional white background) during the day, but would love the option of a Classic-Inverse dark background for late night browsing. What would be even cooler is for those choices to be set by browser/device rather than by login, so that I could get dark mode on my phone and Classic Plain on my browser without having to toggle things back and forth by hand. You can do that! See the last paragraph here. And not sure what you mean about Classic-inverse dark mode... that's just Classic, I think? > You can do that! See the last paragraph here. Oh, I misspoke. I meant just "Plain", not Classic-Plain. I use Plain white, but would also love a Plain Dark. But I guess I'm not seeing how regular Classic is different from Plain-Dark? > I'm not seeing how regular Classic is different from Plain-Dark? Hmmm. Now that you say that, I'm really not sure. The fonts "look" different - thicker - somehow, but that's probably just light on dark vs dark on light rendering. And it isn't in black. But I should give regular Classic a try on my phone and see if it helps. The solution was (90%) there all along! A couple comments I counted as confusion about plain could have been legitimate anti-color statements - not everyone showed up again after the mod clarification so it's hard to say. Hey, I just noticed it also seems like the little colored bar at the top of the screen in Classic Plain mode is the wrong color on FanFare, Jobs and IRL. It's the right color for other subsites, but on those ones it goes back to blue. I guess when FF, Jobs, and IRL were added, there was no colorizing done for them in that theme as well. Seems like a no-brainer to make them the right color in the Classic Plain mode, at the same time as fixing them in Classic mode. Probably pretty easy, too! Seems like there's no good reason to not fix that as well. If there were such a reason, I'd be interested to hear it. Yep. Yeah, we're gonna wrap that subtle improvement in as well. So, to amend the previous reassuring declarations, Plain will be very slightly affected! By regularizing that subsite-specific splash of detail color on the otherwise still totally pristine and white pages. I cannot read this entire thread but am I the only one who would prefer a more subtle plummy purple? The dark purple with white text is stabbing me in the eyes and I am not usually sensitive to that kind of thing.